How Many Edge Sites Will It Take? As latency bounds go down, the number of locations goes up. 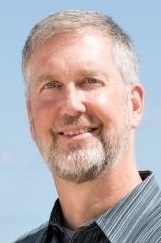 John A. Dilley is Chief Architect for Rafay Systems. But how many edges will it take to cover the planet ... with a low-latency network? The Beatles' lyric makes no sense: you cannot fill a hall with holes. But let's take the related question as a thought experiment – and see how many edge locations it would take to provide fast service for network requests. In this context, an "edge location" is the closest place to you that runs some application you're interested in. How many do we need to get network communication delay low enough for fast service? This is a key question for edge computing because moving apps closer to users provides better performance. Assume for the moment that we have enough compute resource to serve the request at each location, so we need one location close enough to each user such that network latency is below a given bound. Latency is the minimum packet travel time, bounded by the speed of light in fiber and optical/electrical links. So how many locations will we need to be within a certain "latency envelope" of everyone on every square mile of the planet? Earth's land area is approximately 54 million square miles. Let's do some math. 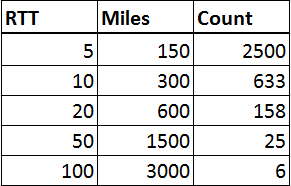 Using a rough estimate that 1 millisecond round-trip-time (msec RTT) is 30 miles geographic distance, a 10 millisecond RTT approximately represents a 300-mile distance, assuming Internet connectivity. A point within a box 300 miles on each side can get to most everywhere in that box within 10 msec RTT (corner to corner is longer, but every point is below 10 msec from the center). That box is 90,000 square miles ... 633 of them would provide 10 msec RTT to all of Earth's land area. This thought experiment ignores network effects, like packet loss and access network delays. In today's 4G mobile networks a base station radio access network (RAN) has an access time of around 15 msec, so getting to 10 msec is already improbable. The good news is the access latency drops significantly in 5G designs, which is right around the corner. And the fact that some boxes will extend over uninhabited water, tundra, and so forth; it's actually the population centers that matter the most. But as a thought experiment allow me some hand waving. We could also use circles, triangles or hexagons, but the numbers will be very similar. They are dominated by the quadratic relationship of RTT (converted to a distance, r) to area (a = r2). The takeaway point is the number of locations increases significantly with lower latency bounds. In my next post, I’ll examine some assumptions made here, specifically the challenges around placing applications in the right edge locations. Each edge will be resource constrained, so we can’t put everything everywhere. And we assumed earlier we have the application in place for the end user.